Modern soldier electronic systems are being developed and deployed at a tremendous rate. Key parameters include short run interconnections, high portability, small size, low weight, rugged performance and higher speed electronics. Combining all of those parameters within one operating interconnection unit takes a lot of engineering, which is where Omnetics comes in. Quick and efficient engineering is completed to meet the objective of the application needed for the mission. Often times, system designers consider ruggedized connectors currently available, and when existing products don’t meet their application requirements, must consider modified connector designs. They may be needed to meet the challenge of their new products and how they are used. Omnetics assists by not only offering samples of the standard connectors for evaluation, but will have a “solid model” design team leader work directly with you to modify the interconnect design to meet your requirements. New connector formats evolve and the changes can be reviewed with those involved directly in the electronics they will be used with. Omnetics begins by using proven connector components from existing QPL certified and military tested connectors. Omnetics connectors employ a BeCu (beryllium copper) spring pin to socket system in their rugged interconnects proven to exceed the shock and vibration testing in Mil. Spec 83513 and 32139. A new connector can be formatted quickly for early field testing with assurance it will perform well in the battlefield arena. Keeping the modern armies of the world up to date is a daunting challenge. As silicon and other chip capabilities evolve, we see a wide range of new technologies that can support military missions more rapidly than in the past. Whatever the electronic application, first and foremost is assuring the highest level of signal integrity being processed during field operations. In all cases, constant signal availability and quality is required in harsh and rugged environments. Cables are designed specifically for the application and environmental requirements, such as high flexibility through long range thermal and U.V. exposure, as well as their ability to handle various signal types. In some cases, the cable designs are very niche specific and other times they serve multiple units on the soldier. Modern soldier signal technologies can vary and have various critical performance parameters. Omnetics’ USB capable connector and cable designs work with Black Diamond’s Hub and Power management systems and have exhibited positive performance for dismounted soldiers in the field. Miniature circular connectors are used to route high performance signals to and from processing units worn by the soldier in the field. Today’s high end vision systems range from long range surveillance devices to weapon mounted LIDAR scopes. LIDAR produces a lot of data in a short time for image processing. Omnetics maintains a special cable group that designs high speed differential twisted pair cable and connectors. These Micro and Nano connectors offer Gigabit signal processing with exceptional low loss by matching cable impedance to the driver and receiver circuits. Completed testing and certification of our performance is readily available via our signal integrity engineer. With cyber and EMI interference and/or detection becoming a critical element in the battlefield, soldiers and their equipment must remain electronically invisible and yet continue to be functional in their environment. In response to this, Omnetics offers fully shielded and tested cable that are interconnected to full-metal back shells for full body cable isolation from outside effects. 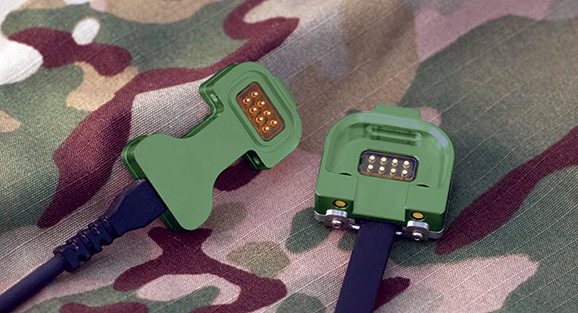 Omnetics’ Micro cable and connector designs serve troops wearing biosensors and environmental warning detectors that can be interconnected with flat-format connectors that are designed to fit within and match the uniform. The Omnetics COBRA connector is aimed at soldier modernization programs such as Broadsword. The COBRA low profile interconnect system is designed for simplicity, easy cleaning and attachment to various soldier worn clothing and equipment with the ability to be attached to the molle strap or be sewn directly into the uniform. Beyond the dismounted soldier, Omnetics is heavily involved in soldier-hand-launched UAVs that are often used for short distance surveillance. Micro-D and Nano-D connectors handle multiple signals, power and even RF cable when designed into the format. The Micro sized connectors are built to be rugged and lightweight in order to maintain reliable signal processing during the constant vibration often experienced in small unmanned aerial vehicles. 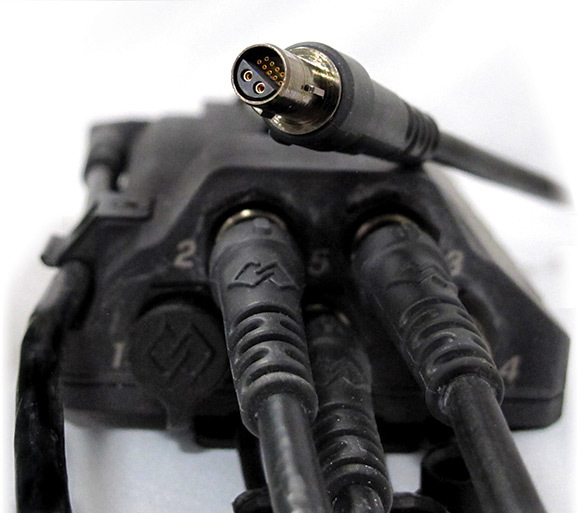 Hybrid connectors are designed to combine larger power pins and smaller signal pins within one connector and cable system. These tailored designs are rapidly appearing as a standard format and often used in new designs. They range from dismounted soldier circuits to designs for UAV (unmanned aerial vehicles), helicopter and portable surveillance electronics. Custom cable design offering SWaP (small, low weight and power) has come of age as rapid cable design and processing is now readily available. Connectors are quickly designed to match the multiple signal demands of the electronics by modifying the insulators within standard connector shells and shapes of shells. Omnetics has taken a lead in offering rapid design review of new format of these hybrid cable to connector systems. When designing Micro and Nano sized cable and connector systems used in advanced systems, consider Omnetics. Our advanced design group works directly with your engineers and forwards early designs to our fast-turn product development group. Early samples give the system designer a big advantage in formatting and modeling our next generation soldier electronics package.